Aluminum foil is a brilliant product, but I recently noticed I was covering everything with foil. Not the furniture or anything nuts like that, but pretty much anything that was going in the oven was getting a sheet of aluminum foil. I could do a commercial about how easy clean-up is if you use aluminum foil. Then it occurred to me that all I was doing was expanding my carbon foot print and that it takes minimal elbow grease to clean the pan in the first place. So now I am going through a serious aluminum foil detox. I’m trying to embrace the naked sheet pan. Food actually roasts much nicer and as long as you use a smidge of olive oil (or other fat), it won’t stick. The same holds true for your cookware, by the way. With the exception of a couple of fry pans for your eggs, you don’t really need non-stick cookware. Stainless cleans up great and if you have a bit of stubborn stuck on food, invest in a can of Bar Keeper’s Friend. It’s amazing! Gets any pan clean. One night I was trying to figure out what to do with a bunch of vegetables in the refrigerator and this salad is what I came up with. Of course, I grabbed a sheet pan and the aluminum foil to roast the veggies. You can see I took these pictures before my aluminum foil intervention. I made the salad again the other night, no foil and everything turned out fine… I was fine, the pan was fine… I’m going to be fine. I’m completely obsessed with this salad. Maybe it’s the combination of the crispy bits of pancetta with the creamy goat cheese? Maybe it’s the shallots with the sweetness of the fig balsamic? Who knows! All I can tell you is that it’s just good! And like all my other recipes, I don’t know how to make normal portions of anything, so feel free to cut it in half. 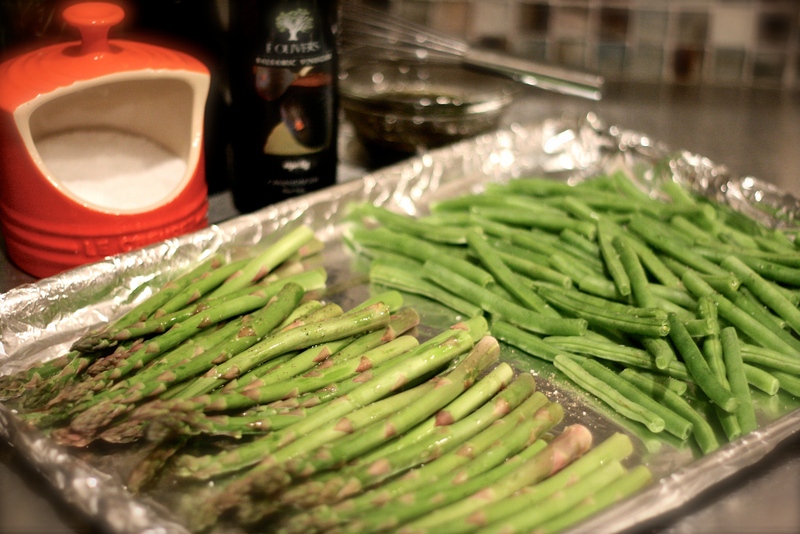 Trim the asparagus and green beans and lay them in a single layer on a sheet pan (no foil needed). Drizzle a little olive oil over the vegetables and roast in your preheated oven for about 15 minutes until they are crisp tender, you still want a little crunch. Give the pan a shake about halfway through. Remove from the oven and set aside. Preheat a small skillet on medium-high heat. Saute the diced pancetta. You don’t need any oil in the pan. 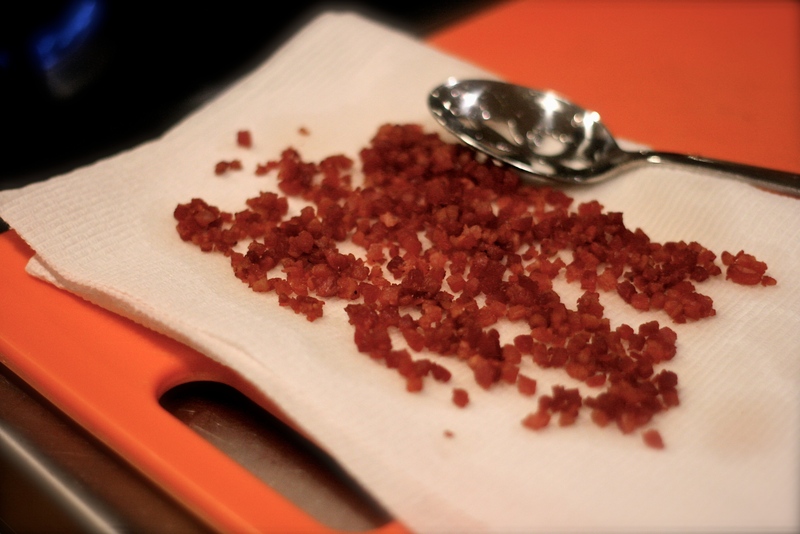 Once the pancetta becomes nice and crispy, transfer it to a paper towel lined plate using a slotted spoon. Set the pancetta aside. 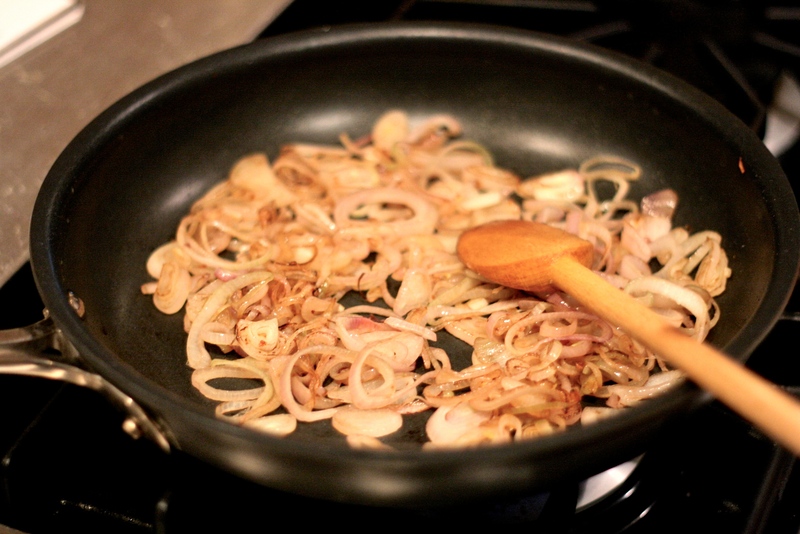 Remove all but 1 tablespoon of the pancetta fat from the skillet and sauté the shallots until they become lightly browned, about 5 minutes. Remove from the skillet and set aside. 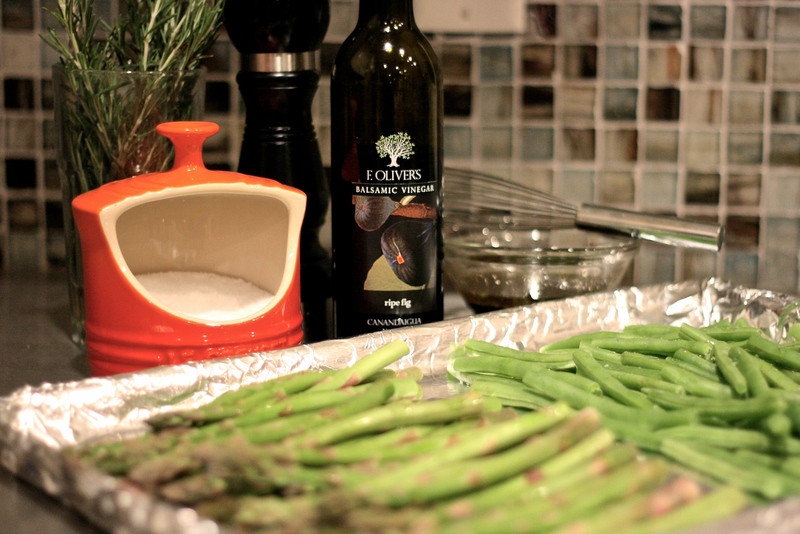 To make the dressing, combine the 2 balsamic vinegars with the rosemary, salt & pepper in a small bowl. Whisk in the olive oil until combined. Set aside. 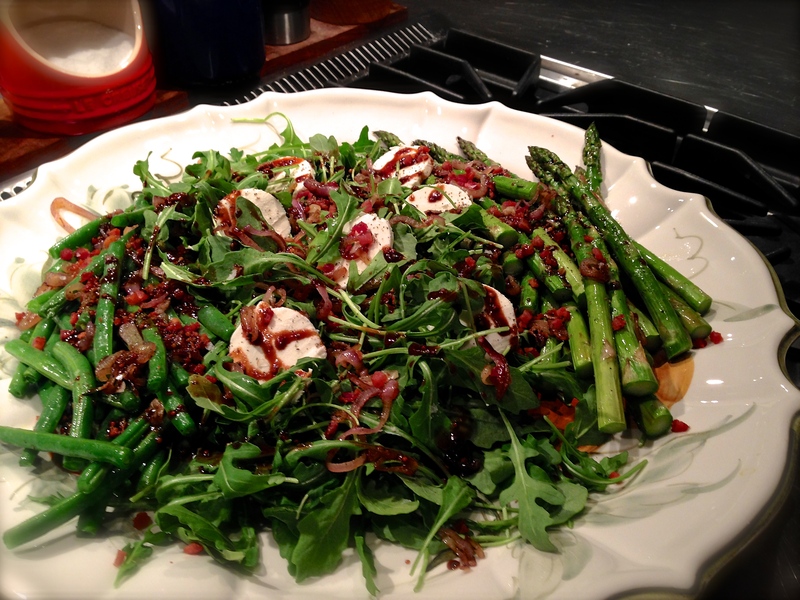 Put it all together… lay the arugula on a large platter. 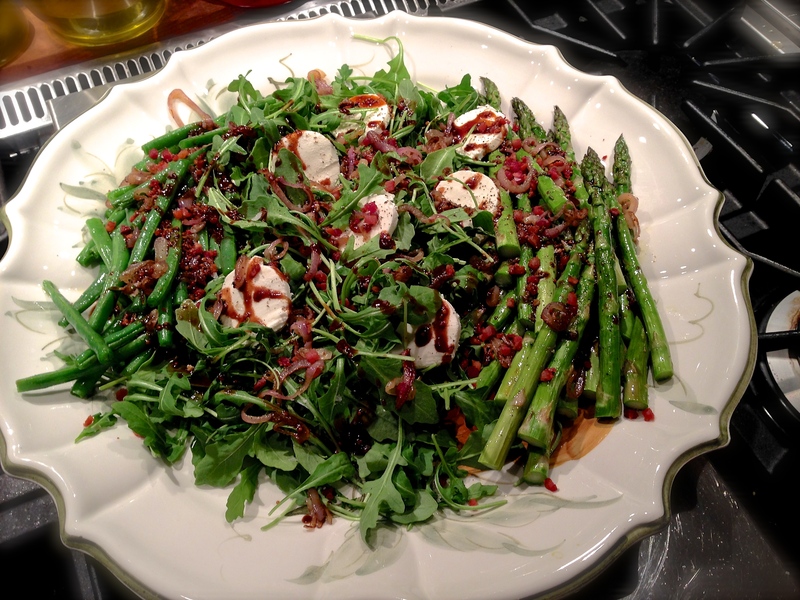 Layer the green beans and asparagus on the arugula. Nestle the slices of goat cheese and sprinkle the crispy pancetta bits and the shallots over the platter and drizzle the dressing over everything. That’s it! So delicious and it looks so beautiful. * You can buy goat cheese in a 4oz log at most grocery stores. I use unflavored dental floss to slice it. It works perfectly. Just make sure the cheese is very cold. If you try to slice it with a knife it will stick and fall apart. * If you can’t find fig balsamic, you can use all regular balsamic vinegar. I’ve found fig balsamic at Wegmans and other specialty grocery stores. It does make a big difference to the flavor of the salad. You could also whisk a little honey in with regular balsamic if you can’t find fig.